What if everyone on Earth suddenly vanished, leaving behind pristine cities devoid of human life? 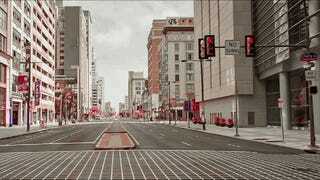 These astonishing timelapse videos show us what cities from San Francisco to Shanghai would look like as ghost towns. Philadelphia, Pennsylvania, directed by Bruce W. Berry Jr.